The Win your Canadian Family Adventure with the Laughing Cow Contest is open to residents of Canada who have reached the age of majority in their province or territory of residence. The Win your Canadian Family Adventure with the Laughing Cow Contest ends on August 13 at 11:59:59 p.m. (ET). Visit wedgeofhappiness.ca. On the Website homepage, click “Start my journey”, then “Register”. Fill out the electronic entry form by entering your name, last name, email address, telephone number including area code, province or territory of residence and the correct answer to the mathematical skill-testing question. Enter a password of your choice. You will then have the opportunity to enter the “Grand Prize” and “Instant Prizes” portions of the Contest. 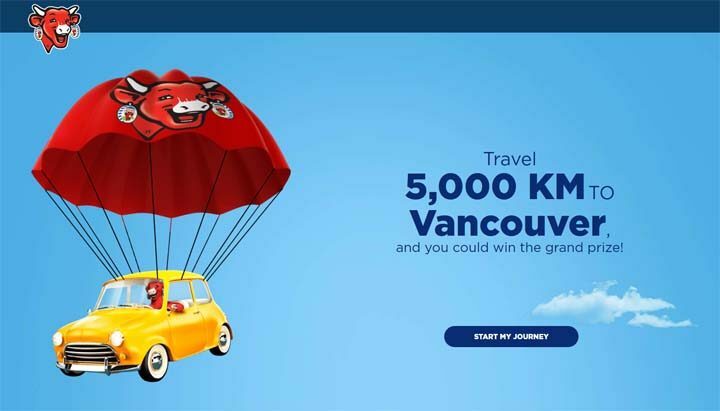 To enter the Grand Prize portion, you must play the game on the Website to finish the 5,000 kilometres separating the house of The Laughing Cow and the city of Vancouver. You can travel kilometers by entering one or more entry codes, by answering quiz questions and/or by using Contest hints. Obtain an entry code by purchasing specially marked Original or Light The Laughing Cow products, in packs of 8, 16 or 24 portions, subject to their availability. Inside the Eligible Products, you will find an entry code. There are 513,722 specially marked products in total. I love to eat laughing cow. Laughing Cow is the first cheese my family goes for. The best.